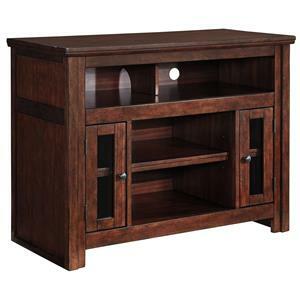 Give your entertainment space a clean look with this casual entertainment console. 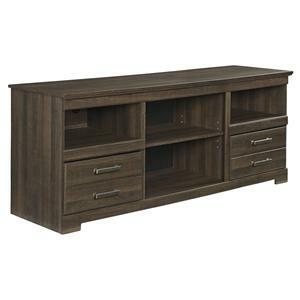 The burnished walnut finish adds a rich wood look to the piece, that is complemented beautifully by the somewhat contemporary linear silhouette of the console. The two doors with a shelf behind each provide plenty of discreet storage for your movies or other entertainment, while the two open shelves with cord access holes are the perfect place to set your favorite media player. 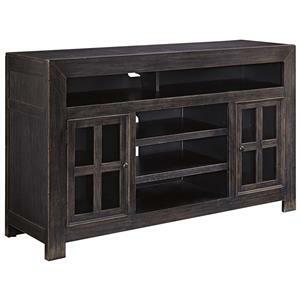 The single drawer in the middle of the piece gives you even more space to stow away remotes or video game controllers. The Contempo Casual Entertainment Console by New Classic at Beck's Furniture in the Sacramento, Rancho Cordova, Roseville, California area. Product availability may vary. Contact us for the most current availability on this product.